mmsonline.com January 2017 MMS 71 FEATURE T he worktable on Omega Plastics' newest, most sophisticated machining center doesn't have T slots. It doesn't need them. From EDM electrodes to mold cavities to the simplest assembly items, vir tually ever y par t machined for the company's plastic injection molds travels from workstation to workstation on a pallet with pre-established work coordinates that eliminate the need to re-indicate. At first, such a system might not seem all that unusual— at least not until one of the shop's larger, 200-odd- pound mold base blocks is brought into the workzone on one of the same kinds of pallets for complete, single-setup machining. At this point, Omega's thinking becomes clear: The automated production process in place at this 70,000-square- foot, 75-employee facilit y is not only reliable enough, but also comprehensive enough that the pa llet re c e i ve r is the onl y inte r fac e the new machine's worktable will ever require. Putting together the three-machine robotic c e l l at th e c e nte r of th i s C l i nto n Tow n s h i p, Michigan, shop's production strategy required p u s h i n g t e c h n o l o g y b e y o n d o f f - t h e - s h e l f capability, says Ken Arbic, mold engineering manager. Accommodating heavier steel required modifications to both machine and tooling, with th e l at te r re s u l ti n g i n f i x tu r i n g s o p re c i s e l y repeatable that some parts can even be removed from and returned to their pallets (or another of No Part Left Behind The right mindset, the right five-axis technology and an intuitive approach to palletization help this mold shop extend automated control to the majority of its high-mix work. BY M AT T DA N FO R D the same style) without losing references. 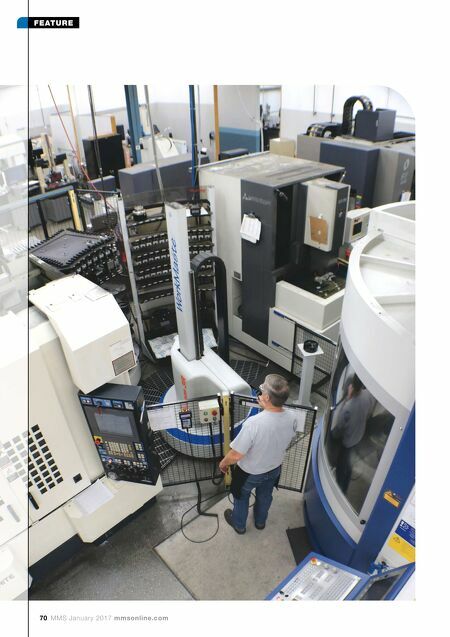 As was the case with implementing automated control in the first place, expanding it to cover the majority of a highly varied, low-volume part mix also required a strong foundation in what many modern mold manufacturers consider a key guiding philosophy. "Ever y thing we do is about achieving a predictable result," explains Jerry Heckendorn, business development man- ager. "Whatever the result, we can work with it as long as it's repeatable." PROCESS TAKES PRECEDENCE The basic idea is to eliminate the variability asso- ciated with the artisanship that defined traditional moldmaking. That means process must take precedence on every job. Specifically, a standard- ized, cut-to-the-CAD-model process, one that's developed in advance and that leverages evidence- based practices, parameters and strategies to ensure consistent quality from tool to tool. Of course, buying into a philosophy is one thing; living it is another. Among the best ways to make a process predictable—to reduce the impact of natural, human-induced variation—is to imple- ment robotics. 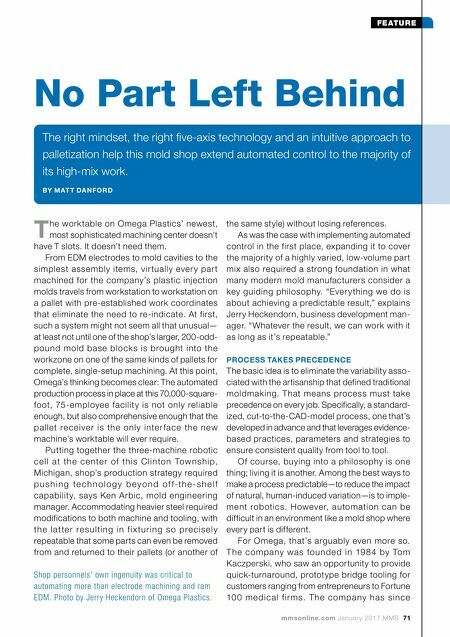 However, automation can be difficult in an environment like a mold shop where every part is different. For Omega, that's arguably even more so. T h e c o m pa ny wa s fou nd e d in 19 8 4 by To m Kaczperski, who saw an opportunity to provide quick-turnaround, prototype bridge tooling for customers ranging from entrepreneurs to Fortune 10 0 m e d i c a l f ir m s. T h e c o m pa ny h a s s in c e Shop personnels' own ingenuity was critical to automating more than electrode machining and ram EDM. Photo by Jerry Heckendorn of Omega Plastics.